Richard Peaslee was born in New York City in 1930. He studied composition at Yale University, and began to specialise in big band music. With Peaslee’s breadth of knowledge, his style has been described as eclectic due to his use of jazz, folk, electronic and instrumental extended techniques. Due to his rich cultural heritage in New York City, Peaslee’s involvement with a range of different genres of music, including film and TV, dance and jazz, became an amalgamation of many different things. Perhaps best-known for his work in theatre and writing scores for chamber groups in Broadway, Peaslee’s other works are not so widely known. 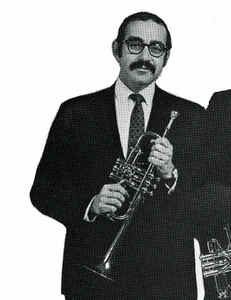 Nightsongs was composed in 1973 for trumpet player, Harold Lieberman. The work, composed for trumpet (that also doubles a flugelhorn) was composed in the midst of Peaslee’s theatre career. There is a strong sense of Peaslee’s love for jazz techniques, as well as extended techniques for the trumpet. Nightsongs is a one movement work for trumpet and flugelhorn with a string orchestra (+harp) accompaniment. The work opens with a four bar orchestral introduction that is led by the harp, which establishes a foundation in G minor. The strings accompany the harp’s arpeggios by gently rumbling on the dominant on the off-beats. The work states to start the piece on flugelhorn, this is perhaps due to it being composed in a low register, which sounds much richer on this instrument. This daringly haunting section sets the general mood and atmosphere for the rest of the piece. The accompanying strings give a swelling effect under the soloist, with them delicately trilling through a full circle of tones. Tension is built up here through the use of non-chord tones, which amalgamate into chord tones, and then back again – giving a to-and-fro effect. The soloist sits on top with a syncopated rhythm, which consists of dotted quavers, triplets and ornaments – all of which are primary characteristics of the main melodic structure. The texture changes a lot throughout the work, with the accompaniment often switching roles with the soloist and reflecting on the main melody. Peaslee’s use of syncopated rhythms drives this section along, with the next section offering a change in character. Based on the twelve-tone row, the next section of Nightsongs begins with a very sparse texture. To support the change in mood here, the soloist is instructed to change back to a Bb trumpet – giving a brighter and more regal sound. The shift in texture leads to an explosion of ascending and descending triplets played by the soloist. The previous haunting atmosphere has been replaced by a more a slightly more hopeful tone. To accentuate the twelve-tone row, Peaslee repeats small sections of the row, often abandoning it on the seventh, which gives the the open feel to the music. F# minor. This lays the foundation for the soloist to flourish on the climax of a top C# marked ff. The syncopated E minor 13th chords ring again, but this time the soloist and accompaniment come together to play the line as one unit. This offers a feeling of unity that is quite absent for the rest of the piece. The accompaniment play a short melodic cell, which foreshadows what the soloist will play, however after this the accompaniment becomes much thinner and less prominent. Peaslee’s jazz roots rear their head again here with the use of C minor 9sus4 chords being played underneath the soloist. Peaslee now uses the Locrian mode in the solo melody, which can be heard in a descending sequence that leads us into the next marked section. Entitled Fast, this section is very driven and exciting. There is a lot of development and variation that happens here, and Peaslee uses varying time signatures to showcase this. Shifting between 4/4, 3/4 and 5/4 enhances the rhythmic drive of this section and keeps both the musicians and listeners on their toes. Peaslee writes some tight harmonies in this section, whilst moving the tonal centres around a lot. He uses the G# Aeolian mode, D Dorian and G# Lydian in the solo line alone. The melodic material is taken from previous sections in the work, however this time Peaslee writes them in 5/4, which adds extra beats and highlights the music’s development from the beginning of the work. The final section of Nightsongs is dramatically slower than the previous section. Starting with a tonal centre on G minor, the solo flugelhorn trills on an E, giving a reflection of development from the opening melody. The solo line goes from the top register, quickly back down to the moody lower register, which accentuates the atmosphere and the syncopation of the melody. The accompaniment is sparse in the last few bars of the piece, with the soloist trilling on a low B. The work ends with two chords, the first of open fourths, the second of open fifths. This gives an unstable and unfinished feel to the work, which matches Peaslee’s undertones throughout the work.